If Christ has not been raised, said the Apostle Paul, Christian faith is in vain. The Resurrection of Jesus of Nazareth is not an incidental or minor aspect of Christianity. If Jesus did not rise from the dead, Christianity is certainly false. Skeptics have long tried to show that there was no Resurrection. Today, there has been a resurgence of attacks on this central truth of Christianity. Some people claim that the followers of Jesus fabricated the Resurrection. Others argue that the disciples hallucinated or had a "vision" of their dead master, which they confused with a truly risen Jesus. Others still suggest that the Resurrection was a myth or that the apostles may have seen a "spirit" or witnessed a "spiritual resurrection" that had nothing to do with an empty tomb and the transformation of Jesus' dead body. Did Jesus Really Rise from the Dead? carefully scrutinizes the historical evidence. Rather than accept Christian belief blindly, top scholars and biblical historians critically examine alternative explanations. In the end, they show why it is a matter of sound reason as well as faith to affirm what the early church proclaimed: Jesus is risen. 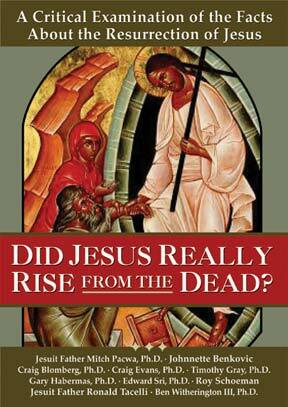 A fascinating, fast-paced exploration of Jesus' fate, Did Jesus Really Rise from the Dead? shows how Jesus' Resurrection has consequences for every one of us. Features Jesuit Father Mitch Pacwa, Johnnette Benkovic, Craig Blomberg, Ph. D., Craig Evans, Ph.D., Tim Gray, Ph.D., Gary Habermas, Ph.D., Edward Sri, Ph.D., Roy Schoeman, Jesuit Father Ronald Tacelli, and Ben Witherington III, Ph.D.